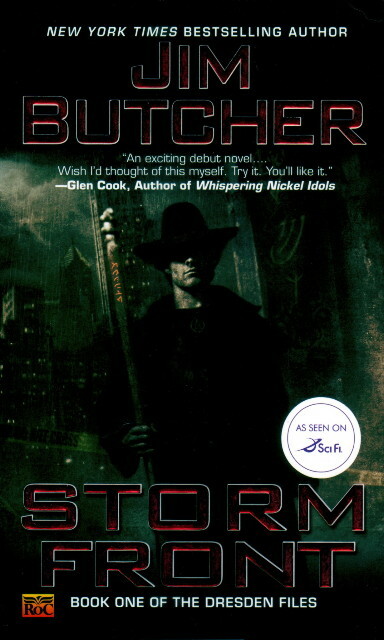 I’d been aware of Jim Butcher’s Dresden Files series for a while, but I’d mentally filed it away along with any number of other series of novels that just didn’t seem like my kind of thing. Although the high concept – a private detective in Chicago who’s also a practicing wizard – seemed interesting enough, it struck me at a glance as being too mass market for my taste. My Dad, however, got into the books and gave me a copy of the first one, Storm Front, to see what I thought. I was still dubious, but gave it a try on my recent vacation. It is, I’m sorry to say, a bad book. The premise mixes noir and fantasy: Harry Dresden is a wizard who’s been put under a doom by the White Council of wizards, due to questionable behavior in the past, and if he violates any of their laws then they’ll execute him. Nonetheless he’s set up shop in the mundane world as a practicing wizard. But business is slow, since he doesn’t want to take on cases involving charlatanry. He sometimes consults with the police department, liaising with his friend Karrin Murphy. Murphy calls him one day to consult on a particularly grisly double murder, which he confirms was performed with a nasty sort of magic. After viewing the scene, he’s met by mob boss Johnny Marcone, who wants him not to look into the case, but Dresden refuses. The same day, a woman named Monica Sells hires him to look into her husband’s disappearance, claiming that he’d been getting into serious magic before he vanished. After receiving a generous retainer, the broke Dresden takes the case. Dresden visits the Sells’ lake house, where he confirms that Victor Sells was using magic. He’s also confronted by Morgan, the sword-wielding minion of the White Council who monitors Dresden’s activities, and who isn’t on Dresden’s side in their disagreement. Dresden continues to investigate both cases, and ends up being targeted by a mysterious wizard who sends a demon after him and who seems to be behind the murders. Dresden becomes stuck between his friendship with Murphy and his responsibility not to reveal too much about the magical world to the mundanes, which leaves him on the run from both his friends and his enemies as he tries to prevent his own murder by solving the cases first. The basic problem with this book is that it’s just plain badly written. Told in the first person by Dresden, the narrative is often overwrought and clichéd (okay, the two tend to go hand-in-hand), with frequent single-sentence paragraphs (“I was driving for my life”) to raise the anxiety level higher in the cheapest of ways. Butcher’s turns of phrase often made me wince, and he sometimes uses words which seem inappropriate to the situation. For example, his client “beamed” at Dresden after he’d rather rudely interrupted her, a mismatch which left me scratching my head trying to figure out what he meant, and in any event yanking me completely out of the story for a moment. The overall writing style is one of lowest-common-denominator suspense, which would be fine (I’ve read plenty of that) if it didn’t keep tripping over its own feet. The plot is a fairly trivial mystery, intended (I assume) to mainly be a vehicle to illuminate Dresden’s world. But his world isn’t really that interesting, and much of it is puzzling. Granted that not all details are going to be revealed in the first book of a series, I still wondered why Dresden seemed to be the only wizard who’d decided to set up shop among the mundanes, and what makes him different from the others that he’d do that. That seems like a fundamental element of the premise which should have been explained up-front. Butcher also seemed torn between coming up with a set of rules for how magic works in Dresden’s world (his explanation of how to make potions, for example, which was pretty interesting), versus leaving much of it unsaid because you can’t really explain how magic actually works. The Harry Potter books had a similar problem early on, and eventually stopped trying to explain everything, which is probably the right choice. Characters’ motivations are sometimes inscrutable. Monica Sells’ behavior early in the book makes very little sense by the end, and Butcher essentially writes her out as a character near the end. Murphy’s reaction when Dresden refuses to tell her everything he knows doesn’t ring true; she ends up feeling like a false friend, which is the opposite of how Butcher tries to portray her in the first half. It would be more effective if she had been forced into that decision rather than making a choice. The strain in their relationship feels artificial, but then most of Dresden’s reactions feel artificial. The book has its good moments, the best being the confrontation between Dresden and Marcone late in the novel. Of all the supporting cast, Marcone is probably the best-drawn, being enough of a twist on the calculating crime boss to be an interesting contrast to Dresden. Butcher’s description of the murders is also good, and his meeting with the vampire Bianca is also well-done, although it ends up being a dead end in the story. But overall I thought Storm Front was a pedestrian story, further let down by the awkward narration. It kept reminding me of the comic book GrimJack in its mix of science and magic and detective noir, but I’d say it’s several steps down from that comic book (especially the earlier issues thereof). I guess now I know what all the hoopla is about, but I don’t think I’ll be continuing with the series. I listened to this on audiobook, and it was narrated by James Marsters (who played Spike on Buffy). Audiobook hides a lot of sins. At one point my disk was scratched, so I cleverly “searched inside the book” on Amazon to read the paragraph or two that I’d missed. On the page, the weaknesses were obvious. But listening to it was fun! FYI The reason for others not setting up “shop” was given. Wizards are not supposed to reveal themselves or the magical world to those who you term mundanes for the sake of safety.Both the safety of the wizards and the mundanes. At some point in the books some character explains that revealing too much to humanity is like unleashing a nuclear holocaust, nobody wins. Things like the inquisition and the witch trials are mentioned. Harry is a bit of a rebel with a cause. Even with the proverbial sword of Damocles perilously close he wants to help people and also pay the rent. Setting up shop so to speak has gotten him into trouble with the White Council although they do not expressly forbid it they certainly frown on him pushing the line. June: The problem with that explanation is it doesn’t explain why Harry is the only one who sets up shop in this way. It suggests that Harry is the first wizard – or at least the only wizard of his generation – interested in connecting with the mundane world. Which begs the question: Why is not a single other wizard interested in doing so? What makes Harry different? That’s what’s not explained. Essentially, Storm Front introduces elements of the wizarding world without any significant explanation of why it works the way it does. So the story is split: The mystery is the driving force of the story, but the mystery is not very interesting; Harry’s background is much more interesting, but isn’t explored in any depth and mainly serves as a cheap way to ratchet up the tension on the main story. It’s the worst of both worlds. I think your question about Harry’s uniqueness needs explaining, itsself. But later volumes slowly reveal Harry’s complex heritage, and that may answer your question. The mystery in Storm Front is, indeed, dull, but the series improves, cf. your essay on Sandman. And then there’s LoTR’s slow windup, which defeated you for years.